I mentioned in an earlier post the experiments of BF Skinner on pigeons. As I said then, the core of his research was experimenting with learning in animals and the extent to which certain behaviours could be “conditioned”. Now, scientists are constantly asked for examples of applications of their research. Indeed, it is becoming increasingly difficult to obtain funding for projects that do not have some form of tangible output. Faced with this question, Skinner came up with an innovative application of pigeon learning which became known as “Project Pigeon” (or “Project Orcon” for “organic control”). The US military was having trouble during World War II with the German Bismarck-class battleship. Medium-range ballistic missiles were still fairly primitive and so there was no way to accurately target the battleships from a distance, meaning that attackers had to come within range of the Bismarck’s guns. Skinner proposed to use the pigeons to guide missiles, instead of the cumbersome and failure-prone electronic guidance systems. Skinner trained pigeons to peck at images of the battleship in return for food. 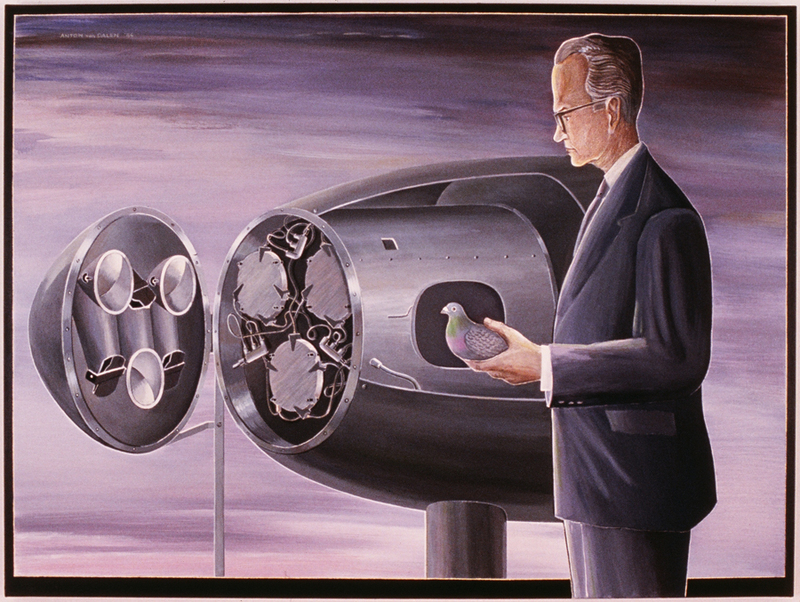 These pigeons were then placed into a special nosecone which was attached to the missile (see below for an illustration by the artist Anton van Dalen, image from his website). This nosecone contained a series of reflectors which gave the pigeons a view outside of the missile. The reflectors were hinged so that the pecking would alter the orientation of the mirrors and this caused a shift in the direction of the missile. The idea was that, having fired the missile in the direction of the battleship the pigeons would take over and, by pecking at the image on the reflectors, correct the course of the missile to impact. Despite $25,000 of funding (around $500,000 in today’s money) and some initial success during training, the project was ultimately cancelled due to improved electronic guidance systems. Skinner famously said “our problem was no one would take us seriously”….